Troy Park—Elkridge, Maryland. The Potomac Exiles entered their third match of the MAC competition knowing that a win was essential to keep pace in the conference. Unfortunately for the visiting men from PERC, things did not go according to plan in the early going. Although they applied early pressure deep in the Brumbies 22, the Exiles could not turn territory into points, and, thanks to tough work at the breakdown and several nice individual efforts, the home side Brumbies found the try zone first in the 8th minute. Baltimore’s fly-half hit the conversion to make it 7-0. 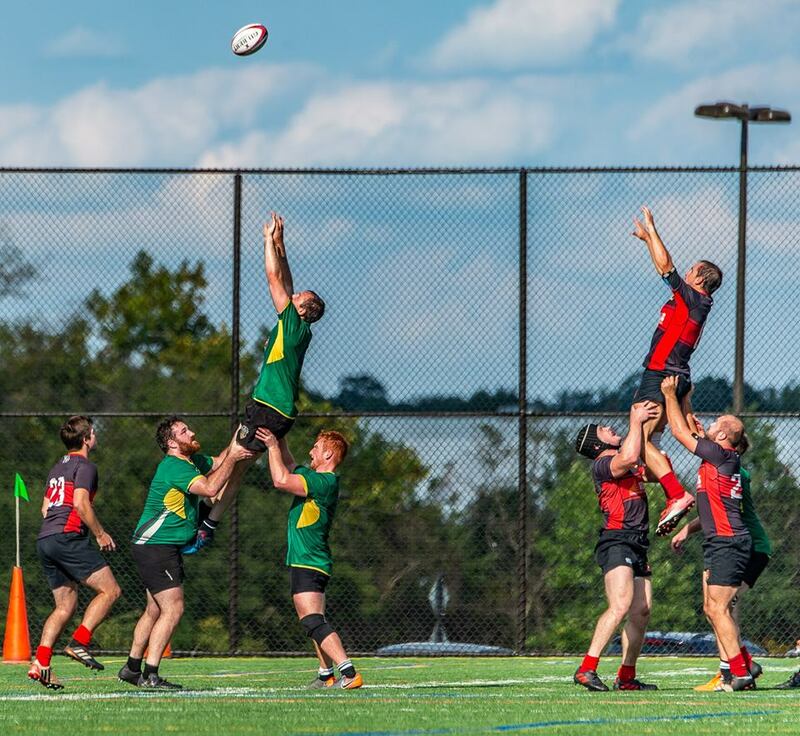 Baltimore proved that the first score was not a fluke, and capitalized on a scrum in PERC territory to score a second converted try in the 14th minute. Things went from bad to worse for PERC as the home side added two more converted tries in the 23rd and 29th minutes to push the score to 0-28. By the 30th minute, PERC’s coaching staff recognized that the starting side needed reinforcements. Bolstered by the inspiring energy of impact reserves Will Taylor (returning from injury), Bill Whalen, and Pat Love, fortune began to favor the Exiles. The slow comeback was truly on when flanker Lars Pettygrove nabbed an errant throw from a Brumbies defensive lineout and dotted the ball down for a try in the 31st minute to make the score 5-28. PERC did not wait long to find the try zone again. Playing from within the PERC half, center Ben Matu broke the defensive line and took off for a long run down the left touch line. Though he was under pressure from several Baltimore players, Matu found his support and zipped a pass to scrumhalf Jon Furman, who finished the play with a 30-meter run to score under the posts. Kenny Rothmann converted the try to bring the score to 12-28 in the 33rd minute. Perhaps sensing that the momentum had shifted, PERC kept the pressure on Baltimore. The visitors were once again rewarded for their efforts when fly-half John Davis spotted space behind the Brumbies defensive line and chipped a kick for wing Joanel Joseph to chase. Joseph outran the retreating Baltimore players and touched the ball down just before it reached the dead ball line. Rothmann converted the try to make the score 19-28 in the 35th minute. That score line held for the next five minutes and the teams went into the sheds with the Exiles trailing by nine points. Baltimore opened the second half eager to regain the momentum. They did just that by adding a penalty and an unconverted try in the 42nd and 55th minutes to extend their lead to 19-36. With their backs against the wall, PERC desperately needed to find the try zone. After back and forth play, PERC managed to punch the ball in with a Brendan Porter try from close range. Rothmann converted the try to narrow the margin to ten points with just over twenty minutes to play. Once again, Baltimore proved their intent by adding a penalty in the 65th minute to push the score to 26-39. In the final fifteen minutes, PERC attacked with a steady sense of urgency. From the restart, PERC’s stout defense earned the visitors a scrum deep in the opposition’s 22. The Exiles worked the ball wide and captain Guy Lopresti finished off the effort with a thumping run. Rothmann hit the conversion once again to make the score 33-39 in the 67th minute. The captain would add one more try in the 74th minute and Rothmann slotted the conversion to put PERC into the lead for the first time in the match. The Exiles did not relinquish the advantage and held on to win 40-39. Several players had big days for the Exiles, including fullback Kenny Rothmann, who went five of six on conversions, and captain Guy Lopresti, who scored two tries in the final fifteen minutes, but Man of the Match honors went to flanker Harry Lee whose clutch tackling and breakdown work ensured that PERC secured the victory. The Potomac Exiles will look to build on this week’s performance when they welcome Schuylkill River to Wallenberg Field next Saturday, October 6th at 1pm.